Proper care is important to keeping your instrument(s) in good condition. Check out our care guide here. What year was my guitar built? Most Gallagher guitars have a serial number printed on the neck block. You can find this number by looking through your instrument’s sound hole toward the neck. If you can’t find the number on your guitar or on this list, please contact us and we’ll help you find more info. Who do you recommend for guitar repair? If your Gallagher guitar is in need of any type of repair, our shop will be glad to fix it up for you. Repairs typically take 4-6 weeks. If you need your instrument worked on sooner, or don’t want to mail it, we recommend using any Martin-certified luthier or repair shop in your area. The Gallagher shop only does repair work on Gallagher guitars. Is my guitar under warranty? The Gallagher instrument warranty covers any defects in workmanship and/or material to the original owner for an unlimited time. This warranty, expressed or implied, is not transferrable to subsequent owners. The warranty does not cover normal wear and tear or accidental damage, including fret and finish wear and damage from exposure to extremely high or low humidity or temperature. Tone is a subjective matter and not warranted. Gallagher Guitar Co. assumes no liability other than the actual repair of the instrument. Defects in workmanship and/or material covered by this warranty will be corrected without charge. A nominal charge will be made for repairs due to damage or wear. All shipping and insurance expenses will be borne by the owner of the guitar. What tool do I need to adjust the truss rod? The vast majority of our guitars have truss rods that can be adjusted with either a 7/16″ wrench or 5mm Allen wrench. 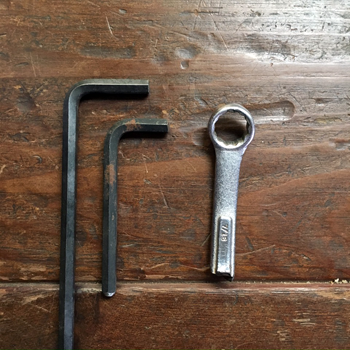 In either case, you’ll need to shorten the handle to be able to use the wrench at the proper angle. Does the shop still make *insert old Gallagher model here*? Yes! As of January 2016, our stock models are the Doc Watson, G-70, GA-35, and the new G-50C. Any other model (Jim Hurst, Doc Watson Signature, 71 Special, etc.) can be built as a custom order. Contact us for a quote and availability. 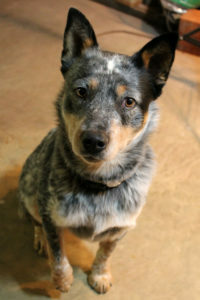 Waylon is the Gallagher shop dog! He likes turkey sandwiches, sourdough pretzels, and banana muffins.